SC, for short, is a Roussanne–a white grape from France’s Rhone Valley–but in the interbreeding done by Donkey and Goat, the wine spent 16 days on the skin, resulting in this beautiful, orange (or “unfiltered”) wine. Now, I have had some weeks (and nights) that have blurred around the edges, and this wine is no exception. It is not what you expect. 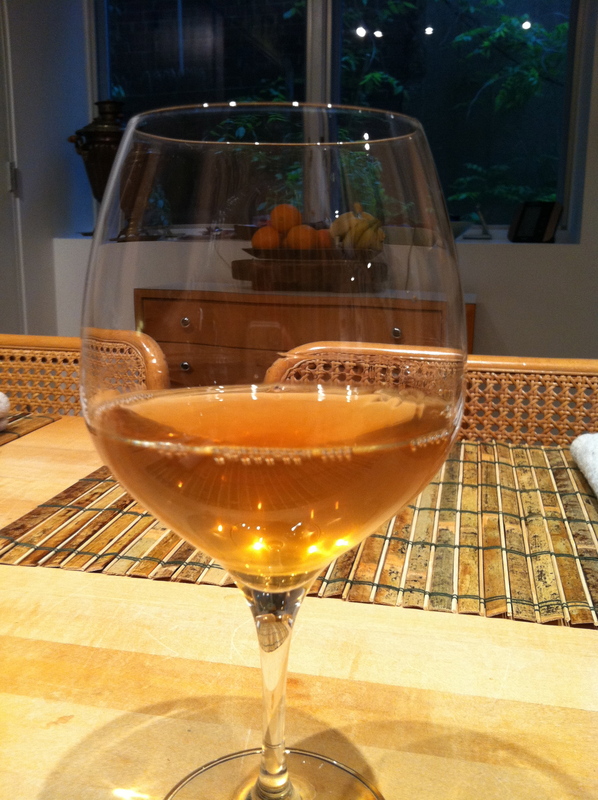 At first sip, I thought I had poured the wrong bottle–it tasted distinctly like cider. But plunging back nose-first, and adding the obligatory air to the taste, I came up with a wine that was more complex around the edges. There was definitely apple and pear, but no oak to speak of that one imagines would come with a wine of this color. Fuller bodied, medium to long finish, this wine had some density I associated with tannins and minerality that off-set it. It was zesty in the sense that it was bright, but held back slight punch, as if marking a territory all its own. All that said, it is a good wine, but I couldn’t get past my connotation of cider with the apple sensations. I would order this wine again–maybe with a little more hearty and savory meal than the chicken with which I paired it. This night, I saved some of my training sense and didn’t finish the bottle, but think, like all things blurry, it deserves another chance. And a good home. We’ll see in another 40 days and nights if I can give it a second go. You can find this in Cleveland Park (or on-line). It is a premium try at $34.99, but definitely cheaper than a plane ticket!